As part of its analysis, the Decadal Survey commissioned 25 mission studies to define potential missions it would select its final list from. The full list of mission studies, plus three technology studies to enable missions in the 2020s and beyond, have been posted (http://sites.nationalacademies.org/SSB/SSB_059331). As one poster at Unmanned Spaceflight put it, this is a candy store for those interested in future planetary missions. In future entries, I'll be summarizing the reports (a typical length is around 30 pages) and where appropriate comparing them to each other and to past missions and other mission concepts. Generally, each report will get its own entry, but in the case of similar mission types, I'll compare the mission concepts in a single entry. I'll also combine the summaries with my continued list of the five missions that I find most compelling for the coming decade. To kick off the process, I'll post a table comparing the missions for cost and mission flight times (be sure to read the notes on the table for important caveats). 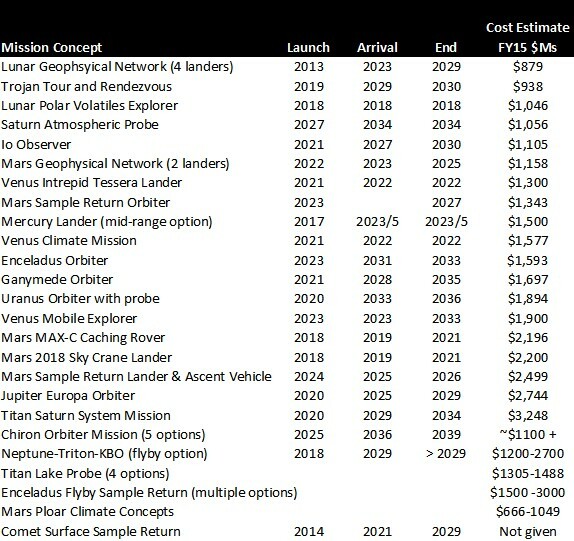 In going through this list, I was happy to see that a large number of missions are reasonably close to the fully burdened New Frontiers mission cost of ~$1,350M inflated at 3% per year for Fiscal Year 2015 costs. Another group of missions could probably fly at a New Frontiers mission and a half budget. 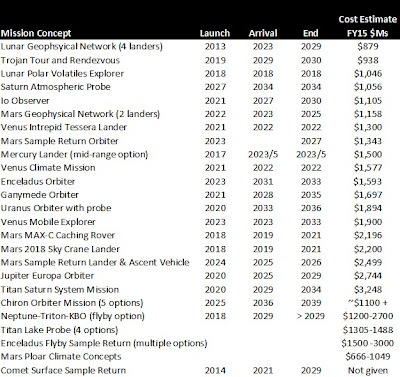 Assuming that the Max-C rover, the Mars Trace Gas Orbiter, and three Discovery missions fly in the next decade, this would allow two to four of the sub-$2B missions on this list to fly. Click on the list for a larger version. A number of the reports analyze several options for a mission target. In this case, I picked either the lowest cost or a typical cost and did the same with the mission timeline. The mission dates can be somewhat arbitrary. For many missions, launch windows occur every year to every few years. For the purposes of the studies, a given time frame was chosen. Use the dates to get a feeling for how long the flight to the target would take and how long science would be gathered at the target. For missions that would involve multiple targets or that require entry into orbit around Jupiter or Saturn, the arrival date is the date at the first target or orbit insertion around the major planet. The cost estimates were prepared by the mission assessment teams. These are not the rigorous cost estimates that will be prepared by an independent team for a subset of these missions that the Survey considered most likely to be recommended. The costs, therefore, should be considered approximations. A difference of a couple of hundred million dollars may not be significant, while a difference of a billion dollars almost certainly is. In addition, early cost estimates are often low, and many of these estimates may also be low. Where the various mission options came with widely different costs, I showed the range of estimates. The next blog entry will describe the two mission concepts that together would be for me be the third most compelling mission for the coming decade. Enceladus Flyby Sample Return sounds *interesting*. Those geysers may be our only real opportunity to get a look at subsurface oceans (or are they just lakes?) on the ice worlds of our system. Mars Sample Return is also up there, as is Lunar Polar Volatiles. I like the Titan Lake probe options which are not so costly. I think we need more planetary lander missions rather than orbiters and Mars is not the primary focus. Too many unknown territories.